From 12th to 15th March the “Dairy & Meat Industry” International Exhibition will take place at the Hall A, Pavilion 75 of the All-Russian Exhibition Centre in Moscow, Russia. Our CDR FoodLab® line will be presented at the event by our Russian Distributor SAFEED. During the “Dairy & Meat Industry” Exhibition you can look closely at the CDR FoodLab® devices and discover more about our innovative analysis systems designed for dairy and milk farms, cattle breedings and laboratories. You can see the instruments and collect illustrating materials at disposal into the SAFEED stand. The “Dairy and Meat Industry” International Exhibition is the only specialized event in Russia that presents the complete cycle of industrial meat and dairy processing – from obtaining raw meat and milk to the production of ready-for-sale products, including equipment, technology, certification, transportation, packaging and storage. The exhibition, arrived at its 11th edition, includes a specific programme of conferences, seminars and round tables. Many themes of interest for the dairy and meat industry professionals will be at the centre of the meetings: amongst the others, “Technologies for the dairy industry”, “Cheese market in Russia and in the world”, “New in cheese making: technology, equipment, ingredients”. Who is SAFEED LLC? It is member of Noack group of companies. It offers products and services, which are applied in livestock production, feed production and its allied industries as well as control and research institutes. These products and services include a broad range of feed additives and raw materials, liquid application systems – standard and tailor made solutions, computer software for feed formulation and feedmill management, training programs and consultancy services. 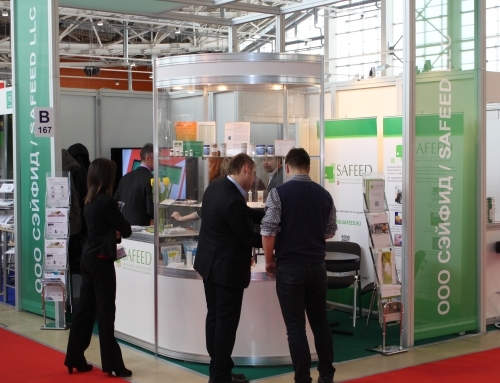 The showcase of the Safeed Stand in Moscow during the International Exhibition. The staff illustrates our products to the visitors. Dairy & Meat Industry International Exhibition: FoodLab instruments will be presented in Moscow was last modified: October 16th, 2017 by CDR s.r.l.